In many cases, most of data to use the development of a model are obtained from the experiments and observations in the past or from published literature. In some cases, however, newly designed experiments and observations are implemented for the particular requirements of the modelers. For adequate designing of experiments and observations, it is desirable for modelers to understand the feature of the experiments and observations of the target ecosystems. In the model of lake ecosystems, for example, various scales of experiments and observations can be designed and implemented as described by Nielsen. These size variations and properties are shown in Figure 2. In the figure, the experiments and observation size can be roughly divided into three classes: chemostats (flasks, small-scale incubators, etc.) in a laboratory (the so-called microcosm); experimental pond, artificially isolated water bodies, etc. (the so-called mesocosm); and the observations of actual lakes. The chemostat experiments are useful to obtain the fundamental property of growth kinetics such as maximum growth rate, half-saturation constant of nutrient uptake, respiration rate, etc., under well-controlled environmental factors such as irradiation and temperature. In these experiments, single species or a few species of organisms are incubated under various conditions (e.g., incubation of Microcystis sp. under various phosphorus concentrations), and the time variations of the biomasses of organisms are measured. Therefore, useful fine data, from the viewpoint of growth kinetics of a certain species, can be obtained. Figure 2 Size variations of some experiments and observations and their properties for the modeling of a lake. variations of relatively small organisms (e.g., phytoplank-ton and zooplankton) under artificially controlled environments (e.g., fish biomass, irradiance) are observed. The information about the structural dynamics in a water ecosystem during the relatively short periods can be obtained. The fluctuations of environmental factors are relatively easy in the mesocosm experiments. The whole mass balance of an ecosystem can be approximately obtained under nearly natural conditions. Consequently, mesocosm experiments have been attracting increasing attention in the practice of structural dynamic modeling. Of course, it is desirable to install the mesocosm into or nearby the actual lake in question. The larger-scale and long-duration information, of course, should be obtained from the actual lake. The data, especially for structural dynamics, obtained from the actual lake form the most important information. However, in many cases, the data are not newly collected especially for the purpose of the structural dynamic modeling. The data which are already collected in the past are utilized. Therefore, the sampling points and sampling intervals are generally limited. As a result, it essentially has high variability. The measured items are also limited in many cases. Therefore, we should combine these data to model the structural dynamics of the lake (see the next section). We now consider an example of the bottom-up approach to model the structural dynamics in a lake ecosystem using the data from experiments and observations. In this example, the lake modeling is also intended. 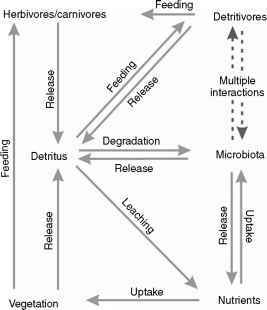 At the first stage, the flow diagram of the model (Figure 1) (with details such as multispecies of phyto-plankton and zooplankton, multigrowth stages of zooplankton, etc., included) is determined. Of course, most aspects of concern must be included. In this stage, one can determine the structure of the food-web network on the basis of the correlations between organisms obtained from the above-mentioned mesocosm experiments, or actual lake observations. In the next stage, the kinetic equations and their parameters for each organism are determined, based on the knowledge from literature and/or chemostat experiments. After the complete formulation of the concerned system, the parametric sensitivity analysis is performed, and the sensitive (critical) parameter set is elucidated. Then, the sensitive parameter set is calibrated within certain ranges on the basis of the data from mesocosm observations. The calibration ranges of the parameter set are also determined based on the knowledge from the literature and/or the chemostat observations. Note that the kinetic parameters of natural organisms are essentially distributed. From this circumstance, the probability distributions of kinetic parameters are assumed in some cases. Of course, in these cases, the calculated values also have probability distributions. Then, in the final stage, the model is extrapolated to the subject lake by considering its physiographic characteristics and environmental factors. The model validation is performed using the actual observation data. Of course, in most cases, relative minor calibration is required in this stage. However, as mentioned above, several organisms should be included in a model to describe the structural dynamics in an ecosystem. Thus, as many organisms (state variables) as possible should be included in the model. However, it is also clear that this leads to an increase not only in the number of parameters that should be calibrated, but also in the whole uncertainty of the model. Furthermore, there is also a certain limitation of the kinetic data. This is a fundamental drawback of the bottom-up and structure refinement modeling approach described here. To reduce this drawback, some rationalization methods such as likelihood test can be applied to modify the models. Furthermore, descriptions of the long-term feedbacks such as various adaptations, selections, and emergence of new species, as described before, are essentially difficult or impossible in this modeling procedure. This is also why a holistic approach, described in the next section, is now desired, especially for the description of long-term structural dynamics. Actually, it is obvious that a food-web network in an ecosystem is very complicated in most cases. Furthermore, the food selectivity of a predator changes due to a change in the availability of prey (if a species is in a starvation state, it may eat a wide range of preys), or change in environmental condition. The properties of the components (organisms) are fundamentally varied. For example, it is often observed that same species have different properties depending on the location of ecosystem. And many organism groups have age distribution and, as a result, the body size and their growth kinetics vary. The rational modeling of these properties is the key to describe the structural dynamics in an ecosystem. From this point of view, a holistic approach to construct structural dynamic models is receiving more attention today. The concept of the holistic approach for ecological modeling is discussed in depth mainly by J0rgensen and colleagues in a series of studies that appeared in the journal of Ecological Modelling and elsewhere. The most important point of the holistic approach is that the kinetic parameters of the model are assumed to change depending on the time elapsed, and the parameter values are calibrated to be consistent with the ecological principles. To estimate the degree of consistency with the ecological principles, an index called 'goal function' is introduced in the approach. Until today, some goal functions, such as 'exergy' (described below), have been proposed. For a detailed description of these goal functions, the reader is referred to the literature. Exergy is one of the most widely used goal functions in the structural dynamic modeling. J0rgensen suggested a typical procedure of the holistic approach of structural dynamic modeling (Figure 3). In this approach, exergy is used as a goal function. At the first step, the model structure and parameters are determined. A set of sensitive parameters is selected by sensitivity analysis. 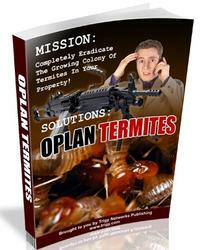 Of course, the procedure described in the bottom-up approach can be employed in this stage. 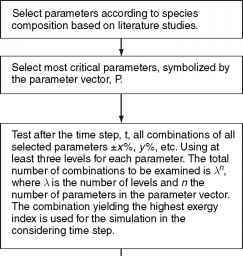 The selected parameters are then fluctuated within a certain time step, and the resultant exergy value is estimated. A parameter set which leads to the highest exergy is considered as the most feasible parameter set in the time step. In this manner, the feasible parameter set in each time step is determined. In the following section, exergy is briefly reviewed as a goal function of ecological structural dynamic modeling.